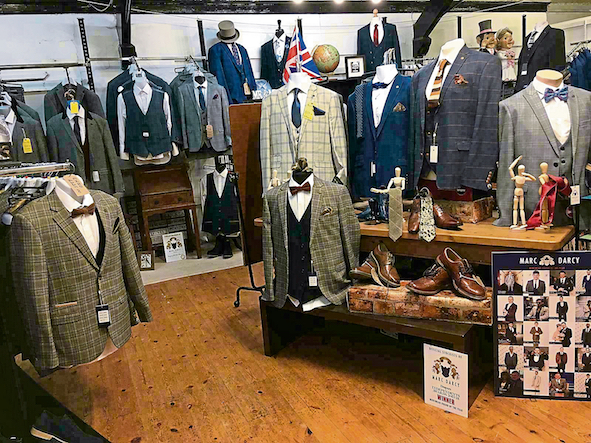 For those of you who are acquainted with the gem that is Blidworth Menswear, there's no surprise when you walk through the door of the Old Chapel on Dale Lane, Blidworth and are greeted by a fully loaded menswear store. Filled to the rafters with everything you could need to leave as the dapper gentleman you always knew you had in you, the business has undertaken a fabulous transformation over the past two and a half years. From the full production, high street suit manufacturer, Guy Warwick, through to a fully stocked factory shop, when production moved overseas, - Blidworth Menswear - supplier of award winning brands and contemporary men's suits, emerged from its chrysalis to become the one-stop Menswear shop that it is today. The fabulous transformation is thanks to Glynis Staddon who has been on this journey since the early days, taking the business from the place where Dad bought his work suits, to the thriving supplier of Marc Darcy and Scott by the Label, Skopes, Lloyd Attree & Smith, and Ikon to name a few. Glynis and her staff offer a service which provides a full male wedding package, from fitted three-piece suits and separates, through to shirts, shoes, ties and matching top pocket handkerchiefs, and not forgetting the cuff links and braces, plus a cap and overcoat if required. Wedding parties can currently take advantage of our 'Groom Goes Free' offer when 8 adult suits are purchased or Half price when purchasing 4 adult suits. The on-site tailors, Steamforce Alterations, ensure the perfect fit for your big day. For more details please see advert here. Glynis and the team look forward to welcoming you to Blidworth Menswear soon.